That mega-deal last week which saw Andy Serkis' Mowgli head over to Netflix? Apparently it was just the beginning, because now the streaming giant has become the home of another long-developing project Serkis has been working on, his adaptation of George Orwell's Animal Farm. 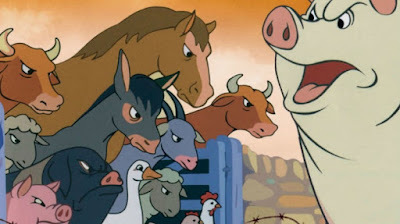 In the works since at least 2012, the film is a live-action/motion-capture hybrid of the Orwellian classic, a political allegory about a group of farm animals who rebel against their human masters. Serkis will direct and obviously play a part in the motion-capture aspect, and he'll be joined by his War for the Planet of the Apes director Matt Reeves and longtime collaborator John Cavendish as producers. The plan is to present the story in a contemporary fashion rather than reflecting the Russian Revolution. No word on when this would shoot, but it could be a while due to the large amount of pre and post-production required for a motion-capture project like this.